Stay updated on all the latest Branson news and information. Silver Dollar City is surrounded by the beauty of the Ozarks and, from its inception, has been steeped in the tourism history of Branson. Indeed, over the years, as it has evolved from "Marvel Cave" into an international award winning theme park, it has "written" a large part of that history. Read entire article here. Grab an Easter getaway package with Branson music show royalty, The Presleys'! For as little as $219, you'll get two tickets to Presleys' Country Jubilee, and a two-night stay at the comfortable All American Inn & Suites where you'll enjoy a substantial complimentary breakfast, and cookies in the afternoon. Stay another night, and add two tickets to your choice from a list of six great shows that includes New Jersey Nights and SIX. 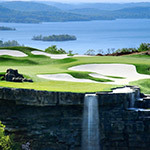 Your Easter getaway also comes with a Branson Guest Card Savings Book! View packages here. There's so much to see and do in Branson that it is sometimes hard to focus in on specific things that you might want to see and do. That's true whether you're an adult or child. 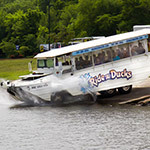 The headline refers to "your kids," and the following list is written for them, with "age appropriate" help from an adult where needed with younger children, to give them an overview of the exciting, fun and entertaining things they can enjoy while in Branson: Read entire article here. Shoji Tabuchi fiddling around with Bigfoot? If you asked ten people in Branson the question, "Of all the Branson entertainers which, group or entertainer, is least likely to be involved with the Animal Planet TV show Finding Bigfoot?" 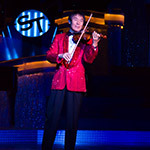 I'm betting it would be Branson's master violinist and fiddle player, "Shoji Tabuchi." Yet, earlier this week when I talked with him about a rumor that he was going to be a guest on the show, he confirmed the rumor, but said he could not discuss any of the specific details. Read entire article here. 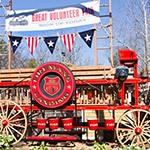 "Buzzin in Branson" is a concise and easy to read list of the major events taking place in Branson, Missouri during the month being "Buzzed," which is April of 2015 for this issue. Each issue contains the "Branson Buzz of the Month" and a list of the major special events, shows and events for the month. Read entire article here. The "Irish Celebration on the Titanic" is the Branson Titanic Museum Attraction's (Titanic) annual celebration and remembrance of Ireland's involvement with the "RMS Titanic" lasting the entire month of March. 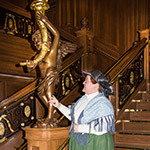 The "hat" and "Bridgette Delia McDermott," both their story and the way it is presented, not only tells the story of one of the luckiest people aboard the ship that night, but illustrates just how special the Irish Celebration on the Titanic is... Read entire article here. 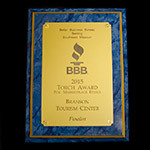 "It is an amazing honor to have been selected as one of the three finalists in the 2015 Southwestern Missouri Better Business Bureau's 'Torch Award for Marketplace Ethics,'" said Lianne Milton, the CEO of the Branson Tourism Center (BTC). "When my husband Larry and I started BTC 12 years ago, 'excellence in customer care, marketplace excellence, advancing marketplace trust and consumer leadership' were the cornerstones upon which we built our business model and are still the defining standards we strive to meet on a daily basis." These are also the principles embodied in the Torch Award. Read entire article here. 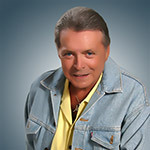 "Bob Hope's theme song, 'Thanks for the Memories,' comes to mind when one thinks of all that Mickey Gilley has meant to Branson and its visitors over the past 25 years," said Annette Wood, the Director of Sales and Marketing for the Branson Tourism Center. Wood made the comment in connection with Gilley's recent announcement that 2015 will be his last season performing at his Branson theatre. 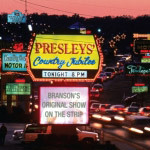 Gilley indicated that he plans to continue doing road shows and will maintain his Branson residence. Read entire article here. Should Sir Branson personally look through "his grand-dude eyes" to discover amazing Branson opportunities? Yes! 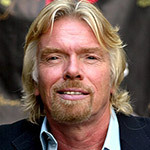 Sir Richard Branson is a one of a kind entrepreneurial visionary with the innate ability to personally relate to and care about the average everyday person; the very type of person that makes up the bulk of the millions of visitors who come to Branson each year. That combination, his life's experiences and his obvious joy at being a "grand dude" puts him in an ideal position to personally discover wonderful new innovative Branson opportunities that have either been ignored or not even thought of by others that will, like Silver Dollar City decades ago, have a major impact on the experience Branson visitors will have far into the future. Read entire article here.